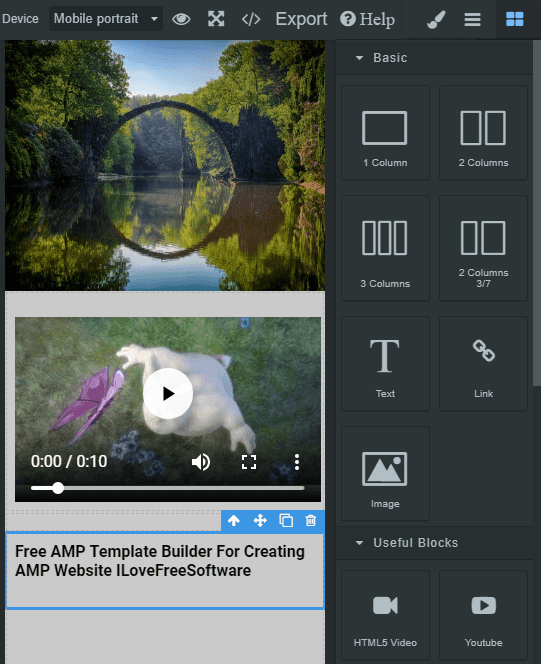 AMP Templates is a AMP template builder and offers you some free AMP website templates as well. Here you can find some pre ready template that you may need and download them. There is a drag and drop AMP template builder as well which you can use to create a custom template. On the builder you can drop the different HTML components and then see the mobile preview as well. And in the end when you are done, you can export the code of the website template that you have created. To create the AMP supported template, you don’t have to create an account. Just use the online site builder of the website and then create your template. AMP stands for Accelerated Mobile Pages. This is a new web development technology to create extremely fast website pages that load in browser with lightning speed. It is new and that is why there is not so much resources for it. But here this website, AMP Templates can be used for that. You can get some ready-made templates and use them on your website. 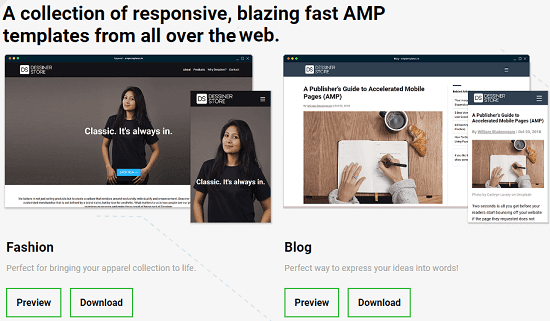 AMP Templates website is simple online tool where you can get some free template for blog, fashion, simple articles, product landing pages, bike shop, and some others. You can preview the templates before downloading them as well. Or, you can directly get the ZIP file containing the HTML and CSS code from the template. Go to the homepage of AMP Templates website and then select a template that you want. You can either preview it or you can download it directly on your PC. It gives you ZIP file containing the AMP code in HTML and the corresponding images. If you don’t find any suitable template on the website then you can create one. If you have any idea of HTML elements and web page layouts then you can use the online template builder that it gives you. You can use the simple drag and drop HTML editor to design the website and then get the code. Simple as that. If you have basic knowledge of HTML and online websites builders then you can easily use this website. Just go to the template builder that it gives you and then simply start building the template for your website. And when you are done, simply get the code and then host it or do whatever you like. If you want to create website with AMP then you can take some help from this free websites, AMP Templates. You will find some really nice templates which you can edit according your needs and deploy them on your server. However, for editing or creating new templates, you will need to have some knowledge of AMP and HTML as well. So, if you are looking for some online resources to get free AMP websites templates then the above mentioned websites will help you.